Fes, Tanya, and Mark sit down with a number of webcomic readers, such as mKinyon, AudioJam, Kurt, Carbonics, Blue, & Spidermonkey from twitter! Consider this research! 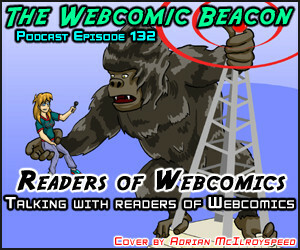 Readers are one of the most important aspects of webcomics, so let’s hear what they think! We also have a live performance of I Wish I Were a Questionable Content Girl. Evan Dahm (Rice Boy) gets interviewed at MIX! 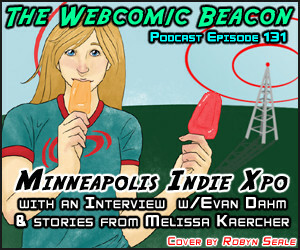 Melissa Kaercher (The Geek Life) joins Fes, Tanya, and Mark to discuss the 2010 Minneapolis Indie Xpo, including a tale of the pre-party bathroom comic! This episode was created out of Episode 130 because it went on for so long! Cover Art by: Robyn Seale (Watcher of Yaathagggu). Fes, Tanya, and Mark give a crash course to webcomics, based off of a presentation Fes gave at the 2010 Minneapolis Indie Xpo. 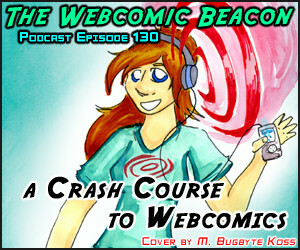 This is a great listen for those new to publishing comics online. This episode went too long and got split into Episode 131! Cover Art by: M. Bugbyte Koss (Messenger). 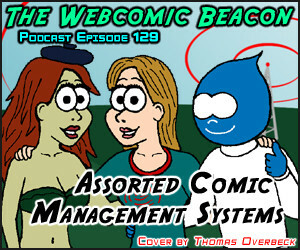 Brad Hawkins, Thomas Overbeck, and Ben Carver join Fes, Tanya, and Mark to discuss a few different management systems to work for webcomic websites. This includes Comic Reef, Drupal, and stripShow (for WordPress). We also get a call-in about AutoGenesis. 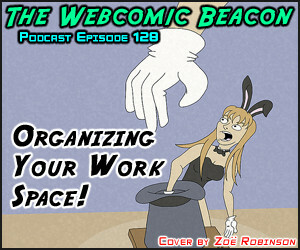 Terry (Godseeker) joins Fes and Mark to discuss how we organizing our work areas for creating comics! We are also joined by Ben Carver, Alex Heberling, and a live chatroom full of listeners! Cover Art by: Zoë Robinson.